University of California, Los Angeles. The Westwood campus. My guess, the 1940s. UCLA came into existence as the State Normal School in 1881. Its original location is where the Los Angeles Central Library sits facing Fifth Street across from the tallest building in Los Angeles, the US Bank Building. The State Normal School was a teacher’s college. In 1919 UCLA moved to its second location. This location was Vermont and Heliotrope where Los Angeles City College sits. At that time third and fourth year students were added because UCLA became known as the Southern branch of the University of California. 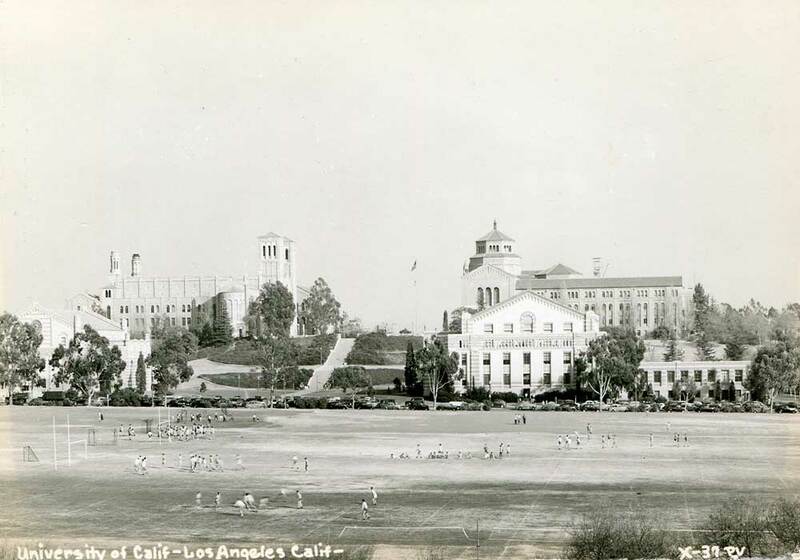 In 1927 UCLA became known as University of California at Los Angeles. Not until 1958 was the, “At” dropped for a comma. Construction of the Westwood campus started in 1927. Students moved onto the Westwood campus in 1929. My parents met at UCLA in 1962 when they were both students. In 1969 two extremely important events occurred at UCLA. First, UCLA became the first node of ARPANET which became the internet. Second, I was born at the UCLA hospital on October 25th. In the study of cultural history one method of dating pictures and postcards is to date the vehicles in the picture. Some years back I picked up this rare postcard of UCLA at a vintage postcard convention. It doesn’t have a suggested amount for a stamp, or any indication when the picture was taken. The number 37 can be seen on the bottom. If you look closely there are a number of parked vehicles above the field. What are the years of these cars? After we make the deduction what years the cars are we then have to ask what would be the typical age of a UCLA student’s car during this period? Don’t assume this was taken in 1937. So if somebody is telling you that you spend too much time looking at cars tell them these skills are needed for archeological purposes. Author, Karl Gerber, was born a writer. His first writing award came in junior high school. In college he wrote several short stories: Hallway (1989); Eggie (1990); Red Pants and Allergy Pills (1990, 2000). In order to support himself Gerber became a employment lawyer. He first gained recognition as an attorney because of his ability to write winning legal briefs and appeals. For ten years, he turned out hundreds of pages of legal briefs each week. His clients were the inspirations of short stories: Odd Client (1994); Dullard (1995). A short reflection on a childhood spent wanting to be something I'm decidedly not.